Bomzh is the Russian police acronym for Of No Fixed Abode and, in a society where registration at place of residence is all, it is among the worst stigma a person can bear. Life is a constant wait in dread for the regulation salute of a police officer, the words "Your documents" and the order to move on. Typically alcoholics, bomzhi also include gastarbeiter - migrant workers unable to find lodgings or work - and others who just ended up in the streets. One Russian charity, sponsored by the Orthodox Church in Moscow, has been working to rescue ailing vagrants from the capital's railway terminals since November 2004. In summer, the five-strong crew of volunteers take a specially equipped bus out by day to administer first aid to sick people few else would think of touching. 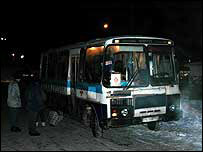 In winter, it becomes the Night Bus of Mercy, a small mobile shelter from the killing frost. When I join Mikhail and his team, my well-wrapped feet soon begin to ache as the temperature dips to 19 degrees below zero Celsius (2.2 below zero Fahrenheit) and a wind gusts around the station square. I should have been there when it fell to 35 in January, vagrants tell me, blank-faced as they sip hot tea around the bus at Kursk Station, the first and busiest stop of the night. Most in the crowd forming out of the shadows will get the tea, a cup of baked beans, a roll. For a few - the genuinely ill - there will be a seat on the bus where they can sleep through the night. While the bomzhi eat and the fortunate ones snuggle down on the polythene-draped seats inside, the Mercy crew's searchers do the round of the station, seeking out those too poorly to make it to the bus. At the next stop, Three Station Square, Vlad takes me with him to scour the halls and yards of the terminals which meet there. The place feels suspiciously empty. Moved on, no doubt. The police do not like them, Mercy's Oleg explains later on, because apart from the drunkenness, the thieving and the fights, they are in permanent breach of the law on registration. When the order comes to move them on, police officers have to obey but they do not want to see them freeze and are glad when the Night Bus tends to them, he says. 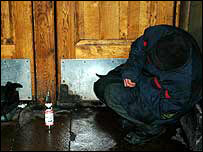 There are night shelters but many bomzhi will not use them because they cannot smoke or drink there. Moscow's station chiefs are expected to take in vagrants when the frost gets really bad. Maybe it is not cold enough yet. When we return to the bus, a long line of bomzhi has materialised. "Where will you sleep tonight?" I ask one lean-looking man who does not have the tell-tale bloated features of the drinkers. "Under the sky, my dear," he replies before heading back into the night in the company of two others, equally sober, it seems. A man has come expecting to get gloves but the bus has run out. He stands looking completely crestfallen, like he has reached the end of his tether. I see the same expression on the face of another man when Vlad tells him he cannot come on the bus because he is not ill. The rules are tough. Lives are at stake. But there are new passengers - two of them are young men I cannot quite see but easily hear, swapping jokes. Where else but at the back of the bus? "Please don't let me be a bomzh. I don't want to be a bomzh, please." Her hysterics have passed but the woman is still hyper, turning this way and that, to one of us or another - the station doctor, Vlad, me, her friend in the background. "I'm so ashamed. Oh, I'm so ashamed." With military precision, Vlad rapidly runs down the list of documents she lost when the thief struck. He concludes she should not get into any real trouble with the police. The woman has just been robbed of 50,000 roubles ($1,777, £1,000) she borrowed in Stavropol to start up a small business in the capital. Vlad has already established the main thing - that the woman's hysteria has passed and she needs no more attention. It is time to move on. There are corners and entries still to be checked here at Belarus Station. Robert, from Georgia, has spent nine of his 35 years in jail for stealing a car. He has just spent the last 10 days tramping the streets with his friend Sergei from Belarus, sleeping in apartment-block entrances. He was working as a builder, he says, showing his calloused hands outside the bus, but they did not pay him for his last job. "I feel sorry for Russia," he tells me, his teeth chattering. "It is such a big country but it can't find jobs for people. It is a great country, yes, but it is a beggarly country." Sergei says he could not live in Belarus. He left it a year ago: "There is no life for me there." "Look at [Roman] Abramovich," Robert breaks in, his voice rising. "He bought Chelsea [football club], okay, that's fine. But look at the Russians. They're cold, they're hungry - look at the clothes we wear. I love football but could he not have put that money into Russia? "In this city, if you have no documents, if you're not registered, you don't work. I was born in the USSR. There was no Georgia, there was no Russia, there was just the USSR. This was my country." Vlad is a bit worried at Kiev Station. He has been looking for Mrs Minosyan and there is no sign of her. She usually comes here, after her begging, to sleep on her feet. A tiny old woman, Vlad says, who learnt to sleep standing up. They took her on to the bus one night and she told them of her life: How she had arrived in Moscow as an Armenian refugee from Baku and was now alone in the world. We do not see her. Back at the bus, the two jokers have got off for a cigarette. Both quite well dressed, in my opinion, but not for the weather. Alexei, wearing only a flimsy suede jacket, tells me a story of how he worked as a pizza delivery man and got robbed one night after a delivery. The pizzeria took his passport as a deposit, he says, and will not give it back until he returns the takings: 612 roubles ($22, £12). His only family is a "crazy grandmother near Leningrad" and she cannot help him. A harrowing story but the crew have warned me that bomzhi are notorious liars. The other man, from near Moscow, is on the streets because of "family problems". Family problems can be worse than 20 degrees of frost, he insists, aggressively. Neither looks ill. I later ask the crew what is wrong with them. Alexei told them he was HIV-positive. His friend has a concussion. It is nearly the end of the round. The Mercy crew - Mikhail, Oleg, Vlad, Alexei and Yulia - will do a second tour of the stations but I will be leaving after we get back to Kursk. I will not see the final passengers who will travel on through the night before reaching a disinfecting centre in the morning where they will be washed and will get any additional medical care from doctors. Mercy will give them fresh clothes if necessary and is prepared to buy them a ticket back home - if they have somewhere left to go.